VILLAGE NIKOLA, Irkutsk region, August 14 (Itar-Tass) — A law on volunteering can be adopted in Russia this autumn, the deputy speaker of the Federation Council, Yuri Vorobyev, said on Tuesday. “Possibly, this law can be adopted in autumn. Different public organizations, including the Public Chamber, are drafting this law,” he told Itar-Tass. Vorobyev regretted that of late this draft law became politically coloured. “It is unclear for me why volunteers oppose this law,” he said. “Every person will be able to translate into reality his/her impulse in this noble humanitarian mission,” he said. “Any country supports volunteers, but we have no such law,” he said. At present, volunteering is not regulated in Russia legislatively. 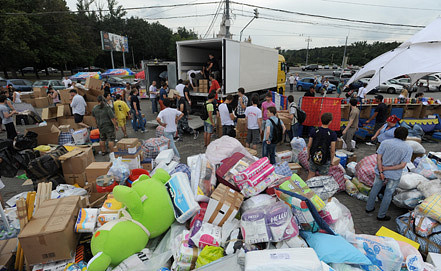 When hundreds of volunteers arrived in Krymsk to help eliminate of the effects of the disastrous floods in the Krasnodar Territory, the issue of adopting a law on volunteering was put on agenda. This evoked an ambiguous response among volunteers, including those working in Krymsk.